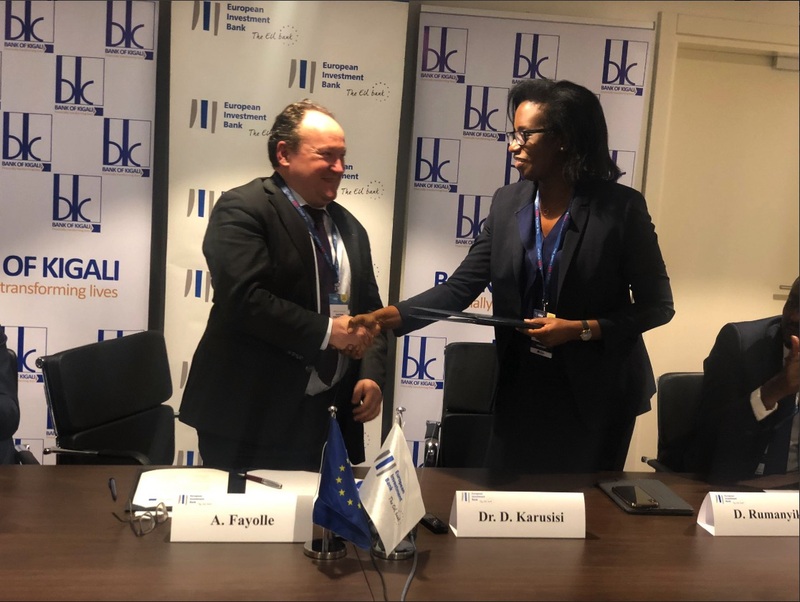 On the margins of the Africa CEO conference, the European Investment Bank, the long-term lending institution of the European Union, and Bank of Kigali today agreed their largest ever cooperation to support new business investment across Rwanda. Under the agreement, the European Investment Bank will provide RWF 30 billion to support investment by Rwandan firms engaged in a range of productive sectors. This credit line will address the need for longer-term business funding, essential to accelerate economic growth, creating skilled jobs, increasing export revenues and improving tax revenues for national socio-economic development. The RWF 30 billion of new financing from the European Investment Bank will be matched by Bank of Kigali and unlock a total of RWF 60 billion of new private sector investment across Rwanda. Ambroise Fayolle, Vice President of the European Investment Bank said that accelerating private sector investment is crucial to create jobs, unlock opportunities and enable businesses to succeed and the European Investment Bank is committed to supporting private sector investment in Africa. “In recent years, companies across Rwanda have benefited from excellent cooperation between the European Investment Bank and the Bank of Kigali. The new RWF60 billion engagement agreed today, our largest ever cooperation with the largest commercial bank in Rwanda, will ensure that many Rwandan companies build on their strengths and contribute to sustainable economic development in the heart of Africa” he said . BK’s CEO, Dr Diane Karusisi, said the banks is committed to serving the business community and supporting priority sectors in line with Rwanda’s development agenda. She added addressing the need for affordable and long-term business financing enables the private sector to become the leading player in the development of the country by steering a transformational and industrial economy. “We have found the right partner in European Investment Bank to ensure that financing is not a bottleneck to creating a vibrant private sector in Rwanda,” she said. Ambroise Fayolle and Dr Diane Karusisi formally agreed the new private sector cooperation in the presence of the Ambassador of the European Union to Rwanda. EU Ambassador to Rwanda, Nicola Bellomo, who was at the signing ceremoney, said that unlocking private sector growth is crucial for sustainable development, jobs and prosperity. The European Union welcomes the new cooperation between the European Investment Bank, the Bank of the European Union and the Bank of Kigali. “This builds on the EIB’s support for the private sector across Africa and the joint commitment of the African Union and European Union to support sustainable investment and jobs,” said Bellomo. The European Investment Bank has provided RWF 63 billion to private sector investment in Rwanda in cooperation with the Bank of Kigali since 2009. Previous engagement has directly supported the creation of an estimated 760 new jobs. This new European Investment Bank backed credit line is built on this proven success and represents the first dedicated support for investment in foreign currency. This reflects the investment needs of internationally active companies and reduce currency exchange costs faced by the Rwandan private sector. With the support of the European Union, the European Investment Bank has provided complementary technical assistance to its partner banks across East Africa over the past years. The new private sector initiative includes a dedicated regional RWF 5 billion technical assistance programme. This will allow best practice learnt from private sector schemes elsewhere to be shared with Bank of Kigali and its beneficiary companies. This will include training to improve banking and credit risk management, environmental and social best practice and sector specific skills such as agriculture value chain financing. In recent years, the European Investment Bank has supported Rwandan businesses investment in cooperation with BRD, I&M Bank, KCB Rwanda, BK, East Africa Development Bank, Trade and Development Bank and AB Bank for a total of RWF 117 billion.